The discovery of a planetary system "out of whack," where the orbits of two planets are at a steep angle to each other, was reported (May 24) by a team of astronomers led by Barbara McArthur of The University of Texas at Austin McDonald Observatory. This surprising finding will affect theories of how multi-planet systems evolve and shows that some violent events can happen to disrupt planets' orbits after a planetary system forms, say researchers. "The findings mean that future studies of exoplanetary systems will be more complicated. Astronomers can no longer assume all planets orbit their parent star in a single plane," McArthur says. McArthur and her team used data from Hubble Space Telescope (HST), the giant Hobby-Eberly Telescope, and other ground-based telescopes combined with extensive modeling to unearth a landslide of information about the planetary system surrounding the nearby star Upsilon Andromedae. McArthur reported these findings in a press conference at the 216th meeting of the American Astronomical Society in Miami, along with her collaborator Fritz Benedict, also of McDonald Observatory, and team member Rory Barnes of the University of Washington. The work also will be published in the June 1 edition of the Astrophysical Journal. For just over a decade, astronomers have known that three Jupiter-type planets orbit the yellow-white dwarf star Upsilon Andromedae. 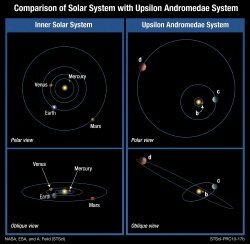 Similar to our Sun, Upsilon Andromedae lies about 44 light-years away. It's a bit younger, a bit more massive, and a bit brighter than the Sun. Combining fundamentally different, yet complementary, types of data from HST and ground-based telescopes, McArthur's team has determined the exact masses of two of the three known planets, Ups And c and d. Much more startling, though, is their finding that not all planets orbit this star in the same plane. The orbits of planets c and d are inclined by 30 degrees with respect to each other. This research marks the first time that the "mutual inclination" of two planets orbiting another star has been measured. And, the team has uncovered hints that a fourth planet, e, orbits the star much farther out. Until now the conventional wisdom has been that a big cloud of gas collapses down to form a star, and planets are a natural byproduct. Left over material forms a disk. In our solar system, there's a fossil of that creation event because all of the eight major planets orbit in nearly the same plane. Several different gravitational scenarios could be responsible for the surprisingly inclined orbits in Upsilon Andromedae. "Possibilities include interactions occurring from the inward migration of planets, the ejection of other planets from the system through planet-planet scattering, or disruption from the parent star's binary companion star, Upsilon Andromedae B," McArthur said. Barnes, an expert in the dynamics of extrasolar planetary systems added, "Our dynamical analysis shows that the inclined orbits probably resulted from the ejection of an original member of the planetary system. However, we don't know if the distant stellar companion forced that ejection, or if the planetary system itself formed such that some original planets were ejected. Furthermore, we find the revised configuration still lies right on the precipice of stability: The planets pull on each other so strongly that they are almost able to throw each other out of the system." The two different types of data combined in this research were "astrometry" from Hubble Space Telescope and "radial velocity" from ground-based telescopes. Astrometry is the measurement of the positions and motions of celestial bodies. McArthur's group used one of the Fine Guidance Sensors (FGS) on Hubble Space Telescope for the task. The FGS are so precise that they can measure the width of a quarter in Denver from the vantage point of Miami. It was this precision that was used to trace the star's motion on sky caused by its surrounding — and unseen — planets. Radial velocity makes measurements of the star's motion on the sky toward and away from Earth. These measurements were made over 14 years using ground-based telescopes, including two at McDonald Observatory and others at Lick, Haute-Provence and Whipple Observatories. The radial velocity provides a long baseline of foundation observations, which enabled the shorter duration, but more precise and complete, HST observations to better define the orbital motions. The fact that the team determined the orbital inclinations of planets c and d allowed them to calculate the exact masses of the two planets. The new information changed which planet is heavier. Previous minimum masses for the planets given by radial velocity studies put the minimum mass for planet c at 2 Jupiters and for planet d at 4 Jupiters. The new, exact, masses found by astrometry are 14 Jupiters for planet c and 10 Jupiters for planet d.
"The HST data show radial velocity isn't the whole story," Benedict said. "The fact that the planets actually flipped in mass was really cute." The 14 years of radial velocity information compiled by the team uncovered hints that a fourth, long-period planet may orbit beyond the three now known. There are only hints about that planet because it's so far out, the signal it creates does not yet reveal the curvature of an orbit. Another missing piece of the puzzle is the inclination of the innermost planet b, which would require precision astrometry 1,000 times greater than Hubble's, a goal NASA's planned Space Interferometry Mission (SIM) could attain. "We don't have any idea what its orbit is," Benedict said. "It could be very eccentric. Maybe it comes in very close every once in a while. It may take 10,000 years." Such a close pass by the primary star could gravitationally perturb the orbits of its planets.